Our most commonly used flowmeters type SF1, CM2 and SF3 are devices for the supply of medical gases with antistatic and graduated measure tubes and complete with a dosage unit. The body is made of anodized aluminium and the inlet connection at the bottom of the flowmeter is arranged to be connected to existing circuits of gases centralized feeding or to the cylinders complete with pressure regulators. At the outlet of the dosage unit, an anaesthesia vaporizer can be connected or the gas mixture can be supplied directly to the patient through the gas feeding unit. For easy access and use of the Vaporizer in combination with the UNO vaporizers, we have designed a table stand. If you order a vaporizer, flowmeter and stand, we will supply these to you mounted. The flowmeters type RM/145-2 are devices for the supply of medical gases with two meters particularly suitable in respiratory therapy. 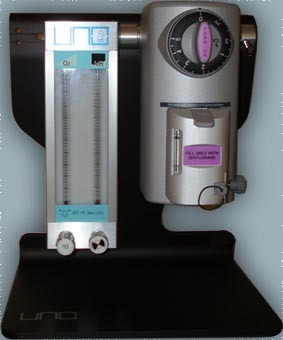 The measure cones are got directly in the PMMA body and the inlet connections at the bottom of the flowmeter are arranged to be connected to the hospital circuits of gases centralized feeding or to the cylinders complete with pressure regulators. At the outlet of the dosage unit, an anaesthesia evaporator (only for veterinari use) can be connected or the gas mixture can be supplied directly to the patient through the gas feeding unit. The flowmeters type FM2200, FM2300, FM2500 and FM2800 are devices for the supply of medical gases with two antistatic and graduated measure tubes and completewith a dosage unit. The body is made of anodized aluminum and the inlet connections for O2 and N2O at the bottom of the flowmeter are arranged to be connected to the centralized gases feeding system or to the cylinders complete with pressure regulators. The gas feeding units includes a valve that automatically blocks the N2O supply when the feeding pressure of O2 drops approximately below the value of 0,8 bar. The mixtures of O2 - N2O can be supplied through a dosage unit. An incorporated mixing device proportions the N2O in such a way that a minimum quantity of at least 30% O2 is always present in the gas mixture. a quick supply of O2 directly at the outlet of the mixture on the gas feeding unit. Hypoxyguard system: At least30% -3% O2 is guarantueed in the mixture with N2O opening value equal to 0,4L/min (with inlet pressure of 3,5bar).